Sarah Hofstetter spent 14 years at 360i before jumping over to the audience measurement platform several months ago. Don’t tell Sarah Hofstetter about your life hack that’s reinvented the wheel, moved the needle or shifted some kind of paradigm -- she’ll probably lose her mind. The Comscore president and former 360i CEO hates adland jargon. Just like most of the normal ones in our industry. "There is no way on God’s green Earth that we need nearly as much of the gunk that is in our system," Hofstetter told a crowd at the 4A’s Decisions 2020 conference in Washington D.C. on Tuesday. She stressed that cleaning up adland’s lingo is the first step in changing the agency world. 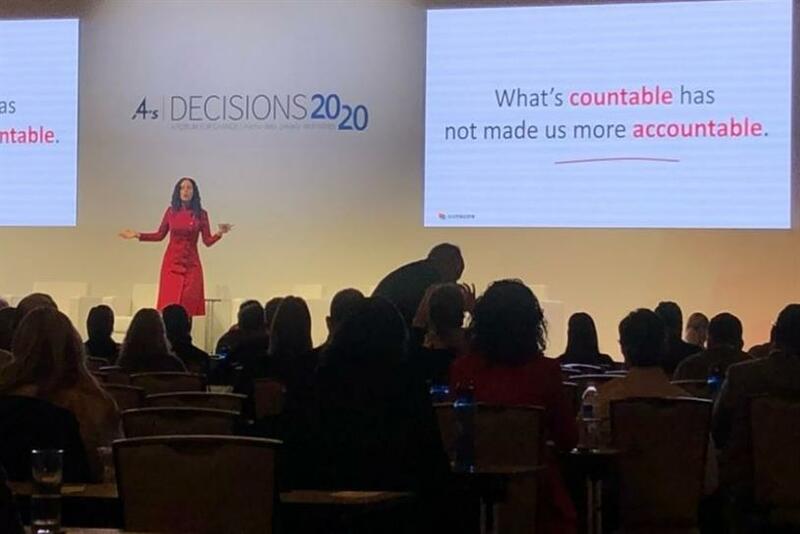 Speaking of her transition from agency to audience measurement platform, she explained: "There was a moment about four months in where I said to myself that just because people are speaking in jargon, that doesn’t mean that I don’t know what I’m talking about. It’s not me. It’s us. "We are a big part of the problem -- we complicate the industry and layer a lot of this stuff on top of each other. We need to step up and start talking to plain English about what we’re trying to solve here." Hofstetter, who encouraged the crowd to play "Buzzword Bingo," said that there are more ingredients in our industry than ever before, but the problem is we don’t necessarily have the recipe yet. She wrote a letter to herself as if she was going back to the agency business -- what would she do differently to change the industry and the way it works? Please. If we’d just talk more simply we could probably get a lot more done. Marketers and agencies are pressured to get the lowest cost media. But then we know it’s crap, so we have to pay and layer all these other folks in the digital media supply chain to filter out the crap. We’re putting more vendors, tags, cookies into a system to clean it up. The supply chain is out of control. You have fewer people, as do your clients. This has to be simpler. We are living in a multi-platform ecosystem, where consumers view media across multiple devices and platforms -- yet we as an industry have yet to master true consistency in cross-platform measurement. There is still a lack of standardization in TV versus digital/video measurement. Buyers and sellers of media need to be able to measure delivery across media platforms and content types in a true apples-to-apples way, as well as consistent, syndicated content measurement. Marketers are being measured against business outcomes, which cannot be evaluated in a silo. All media properties are here for you, yet you are the ones that have become dependent on them. Don’t let the addictions get you so hooked that you can’t see cleanly across types and channels.